If you live in Dallas, I hope that you will be doing your civic duty tomorrow and vote in the Mayoral elections. The Mayor is the face of Dallas to the outside world. He is the person who will be courting new businesses to our city and wooing those that are here to stay and helping them to prosper. 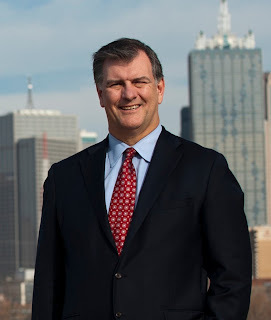 Unfortunately I cannot vote in this race because I live in Park Cities, but if I could, I would be casting my ballot for Mike Rawlings. Rawlings has a proven track record of success in both the private sector as President and CEO of Pizza Hut and Legends Hospitality. And in the public sector as Dallas' Homeless Czar, where he was instrumental in getting the Bridge built to serve our city's homelss population. He has been endorsed by the Dallas Morning News, Roger Staubach, Ron Kirk, the Greater Dallas Restaurant Assoc. and many of our city's top corporations and CEO's. Come on down tomorrow night after 7 PM - after you have voted - and join Rawlings and his supporters (that would be me) at Trece to either whoop it up in celebration or drown our sorrows in tequila shots. There will be a DJ to entertain the troops and a cigar roller. Either way, it will be a fun night.